Joel Feder October 5, 2017 Comment Now! These days, Lexus doesn't do boring. It's all about outrageous styling, big power, and luxurious interiors. The new 2018 Lexus LC 500 has all of the above. No, I'm not high. I'm sober; the LC 500 is serious too. 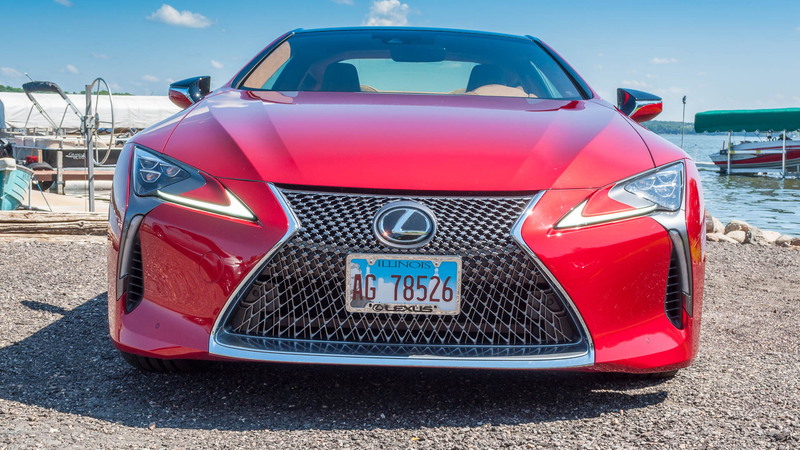 Before you dismiss the wild spindle grille, check out these 10 things regarding the 2018 Lexus LC 500. The 2018 Lexus LC 500 starts from just $92,975? That's right, under $100,000. The LC 500 looks like an out-of-this-world concept car, and it should—it was designed after the LF-LC concept car from the 2012 Detroit auto show. Rolling down the road, the production LC 500 sticks out like it came from the future. Next to a $200,000 Aston Martin DB11, we have to wonder which has a higher price tag. It's rare, but some cars have a truly wild shape that give it not only presence, but also hips. 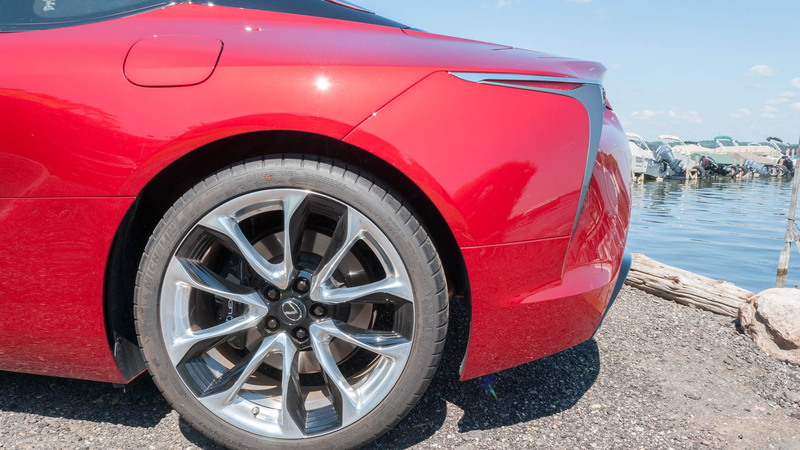 The LC 500 features a Coke-bottle shape with a narrow front end (at 75 inches across at the front wheels) and wide derriere (at 78 inches across at the rear wheels). Aside from the "look-at-me" designs, its width dictates how it drives. It's even more important when parking, and it can make backing into your garage trickier. 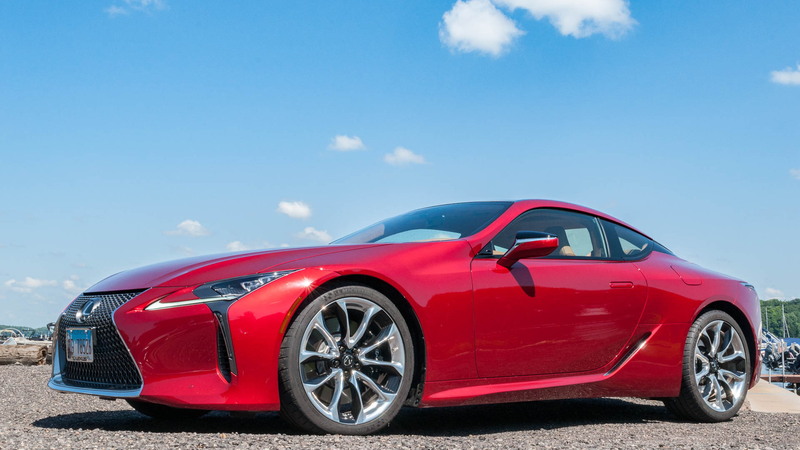 Rumors about the death of the V-8 may be early—the LC 500 has a naturally aspirated 5.0-liter V-8 engine under the hood. It might only put out a modest 471 horsepower and 398 pound-feet of torque, but hear it bark on a cold start and you won't care that you can get more power elsewhere. As you feed into the throttle the symphony of sounds that permeates the cabin—both naturally and artificially via the audio system's speakers—is so good we'd swear its all real. And frankly, there's just something special about the way a naturally aspirated V-8 engine builds its power rather than having a boring, flat torque curve like a sequentially turbocharged engine. It's organic in its power delivery—turbochargers are anything but. The LFA is dead, but its parting gifts to us were its interior design direction. From the horizontal-themed dashboard to the big, thick center tunnel separating the driver and passenger, to the knobs coming off the sides of the gauge cluster housing, the LFA inspiration is alive inside the LC 500. What's more, the fit, finish, and materials all feel and look a cut above the LC 500's price tag. I'm the first to scream when you can't #GiveAShift in a car, but a three-pedal setup in the LC 500 would feel out of place. When it was announced that the LC 500 had a 10-speed automatic transmission, I rolled my eyes. Why would you need that many gears? How will it not get confused? Turns out, my concerns were unwarranted. The transmission shifts quickly, never seems to get confused, and responds exactly as I wanted it to. Unfortunately, it's a bit harsh in stop-and-go traffic, making it difficult to be a completely smooth driver no matter which of the car's modes you are in. While there are paddle shifters, they are magnesium that feel like cheap plastic bits tacked onto the back of the steering wheel—the lone letdown in the LC 500's interior. Lexus absolutely knows how to build proper, quality paddle shifters—the LFA had a pair. Hey Lexus, dig those out of the parts bin when you have a second, please. The LC 500 doesn't feature any of Porsche's black magic. It's big, it's heavy at 4,280 pounds, and there's no engineered magic to make it dance around corners. Push the car faster and it doesn't shrink, and you'll never, ever forget how much heft you're moving around. It feels solid, but it's a grand touring machine—not a sports car. Whether any LC 500 owner will ever wonder whether car seats will fit into the rear seat, or try, is debatable. But before placing that bet, know this: you can fit a car seat in the back seat of the LC 500. My Britax high-backed booster seat fit inside with ease. As for a rear-facing convertible car seat, your mileage will vary, but only the most compact setups will stand a chance. 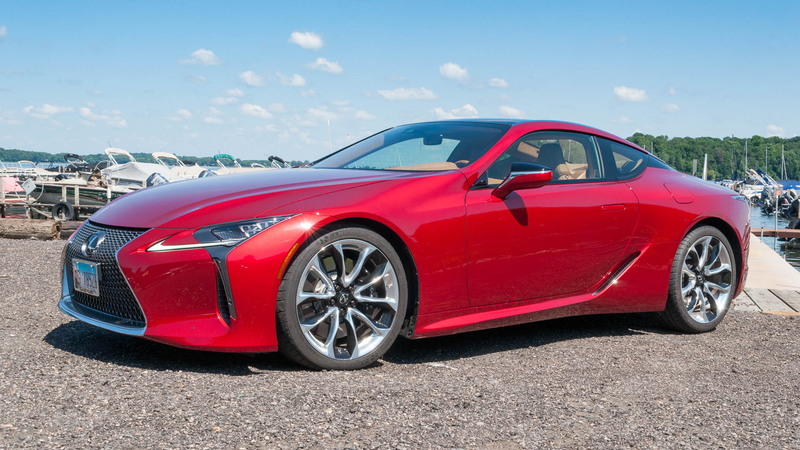 The Lexus LC 500 gets attention—if that's what you're looking for. It looks like tomorrow's concept car, today. What did you expect? It draws a lot of attention both going down the road and when sitting in a parking lot. 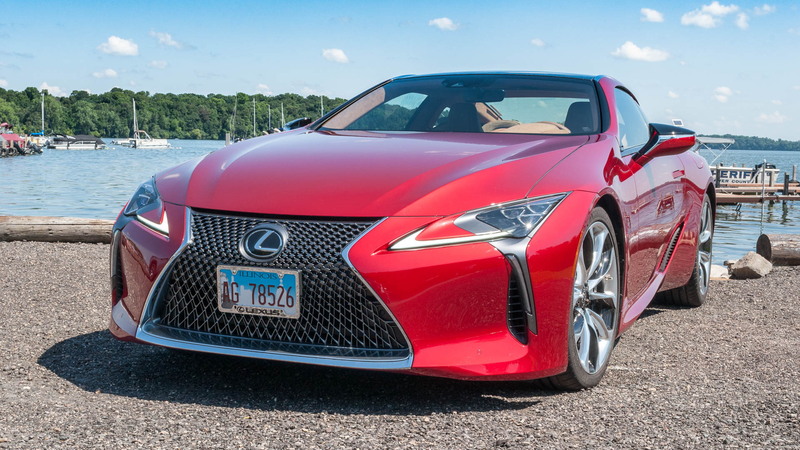 Kids and adults alike flock to the LC 500. The 10.3-inch infotainment screen with split-screen capability is nice, but it's the clumsy interface that fails spectacularly. The main navigational input for this screen is a touchpad behind the gear selector. Whomever thought that was a good idea is only second next to the guy that thought controlling other Lexus vehicle's infotainment systems with a mouse while in a moving vehicle was a good idea. Spoiler: Both are half-baked ideas, and the implementation is just as bad as you'd imagine. Trying to control a screen with only a touchpad isn't easy while stationary, and beyond distracting while blasting down the freeway surrounded by traffic. If you grew up in the '90s you might feel it's weird to lust after a Lexus. Fast-forward to 2017 and if you see or slide behind the wheel of the LC 500, I think your passions will change. This isn't your dad's 1990 LS sedan.